To the author, a five star running experience involves going to an exotic place, running care free and uninterrupted with minimal logistical concerns, and being warm and dry at night. The facilities at the national parks we visited allowed for the perfect arrangement. Before the trip, Devy explained that we'd be staying in modest buildings called "refugios" as we ran through the remote areas of the Patagonian Andes. I imagined a crude, drafty lean-to with a leaky roof. The refugios turned out to be more like simple hostels, with bunk-filled bedrooms, a common lounge area, and a bar/kitchen selling drinks and meals. The itinerary for the trip included three national parks: Torres del Paine (Chile), and Los Glaciares and Tierra del Fuego (Argentina). Other small towns, tourist stops, and notable sights were sprinkled throughout the trip. After flying to Punta Arenas, visiting a penguin nesting site along the Strait of Magellan, we headed north to the Torres del Paine National Park. 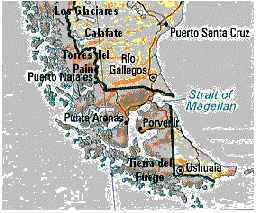 The Patagonian geography is dominated by the pampa, the endless arid rolling plain, the Andes which mark the plain's western extent. We drove through the pampa, with the Andes occasionally visible through distant clouds, passing an occasional lake. Along the way we saw herds of guanacos (sort of wild llamas), flocks of pink flamingos along the shores of lakes (their pink coloring a bizarre contrast to the brown landscape), and Nandus (wild ostriches). We passed through Puerto Natales, and arrived at Torres del Paine. At this point, we had been sitting on our duffs, talking about running for several days, and it was time to get out and actually do some! We dropped our gear at the Refugio Torres, and headed out to see the famous Torres (Towers) del Paine. We ascended about 2600 ft. in about 6 miles. Most of the climb was in the last few miles up through scree and moraine. Finally we reached the base of the famous Torres, and soaked up some rays while taking in the scenery. Beneath the towers was a glacier carved landscape, a silt filled mountain lake surrounded by boulders making up the glacial moraine. After taking in the requisite photos, we zipped back down the hill, for a warm meal and to prepare for the next phase. The following four days, we were to run a counterclockwise loop around the park. We had obtained topo maps, which indicated the trail we were to follow and the refugios in which we'd stay. Unfortunately, no distances were indicated. Instead, each section of trail was annotated with the hiking time. The first day's trail sections summed to ten hours, and Devy had promised that each day would be "long". Our task that night was to assemble a pack full of the gear we'd need for the subsequent four days. It seemed like it would be a simple matter to keep the pack light enough for running, as we did not need to carry camping gear. We needed enough running clothes to accommodate the variable weather, a change of clothes to wear at night, toiletries, some energy bars, and a little money. Two in the group quickly assembled a light-weight pack. The rest of us had the comical experience of hefting what we thought would be a featherweight package, and grunting under its unexpected weight. The next hour saw a flurry of activity, as five runners, in cramped quarters, tossed non-essential items (flashlights, first aid kits, global positioning systems) into the "leave behind" pile. The next day we began the loop, running on a good trail through easy terrain, with vistas of lakes, mountains and glaciers. We arrived at Refugio Dickson (named after the nearby lake) in the early afternoon, after only four hours of running time. We would gradually learn that our running time would be 40-45% of the trekking times listed on the topo map. It had been a cool day, but sunny enough to wear shorts. During the night, the characteristic Patagonian wind began in earnest. The next day was cloudy and cooler. We donned our warmest clothing, and followed the trail up into the mountains. After about 2 1/2 hours and 1300 ft. up, we came to a high mountain lake at the terminus of Glacier Los Perros. Chunks of blue ice were floating in the silty water. We continued up along some extremely muddy trail, ascending past timberline into the high scree-covered slopes. We climbed another 1800 ft. towards a desolate pass. Back in the southwestern U.S., such scenery would occur above 12,000 ft., but here we were below 4,000 ft. Scampering up the trail and over boulders, my lungs were much more comfortable than during mountain running in similar terrain back home. I felt that I was somehow cheating! At the pass I paused to wait for Gard and Byron, who were close behind. The wind whipped through the pass, and I felt quite cold as we regrouped and took a few snapshots. Then, as we crossed over the pass, the most spectacular sight of our trip appeared: A veritable sea of ice, called "Glacier Grey", flowed from the high Andes, hidden in the clouds to the right, through the valley at our feet, ending at Lago Grey, a lake visible far to the left. The remaining miles for the day led us parallel to and above the glacier, dropping to Refugio Grey, located at the end of the ice flow. The last bit of the trail was extremely rugged, and the running time for an estimated 19 miles was 6:20. With no hot water available at this refugio, we experienced showering in melted glacier, piped straight from the lake. The longest shower taken was about twenty seconds. As usual, dinner was served late, around 8PM. Fortunately there was plenty of beer and Chilean wine for sale, and there was an apres ski atmosphere in the lodge. Several of us felt that the portions begin served at mealtime were too modest for our ultrarunning appetites, and we asked Devy to intervene. He headed to the kitchen with a fist full of thousand-pesos bills, to grease a few palms. At dinner the kitchen staff returned repeatedly to our end of the table, dumping their leftover pasta and bread on our waiting plates. We all retired with sated bellies, ready for the next long day. The destination for the next day was Refugio Cuernos, named after the Cuernos [horns] del Paine, massive granite towers lining the Valle de Frances. The valley was an out-and-back extension to the day's route, allowing each runner to tailor the run to their preferred distance. Heading up the valley, along a rushing river, the Cuernos were visible on the right, and the glaciated Cerro Paine Grande on the left. The latter let loose an avalanche every few minutes, providing a spectacular sight at our safe distance, accompanied by thunderous roars. In my zeal to ascend the valley and see the highest vistas, I arrived late at Refugio Cuernos, bringing up the rear after nearly eight hours of running and trekking. The refugio was more refined than the previous one, with hot showers and a large glassed-in lounge with great vistas of the Cuernos and the adjoining Lago Nordenskjold. The next morning we finished the loop with a quick (8-9 mile) jaunt on easy trails, collected our luggage, and were met by driver who Devy had hired to take us to the Argentine border. Midday found us at the tiny border town of Cerro Castillo, waiting for a second car to take us from there to the Argentine town of Calafate. We huddled in a restaurant while the wind whipped across the open pampa. Some gauchos ran a herd of sheep through town into a nearby corral. Later that day we arrived in Calafate, where we checked into a comfortable hostel, occupied by tourists from all over the Americas and Europe. After only minutes at the souvenir shops in town, it was apparent that souvenirs were pretty highly priced. Part of this was due to the artificially enforced exchange rate of one American dollar per peso. We all pitched in to cook dinner that night at the hostel. Byron's culinary expertise was recognized, and he was pressed into service as head chef. The following day we rested our feet, and took a car ride along Lago Argentino to visit the famous Perito Moreno glacier. It was spectacular: Easily the largest glacier seen on the trip, it is also unusual in that it is continually growing, rather than receding. Its face approaches a peninsula, allowing access by car. We were told that Perito Moreno grows until it reaches the peninsula, stopping the flow of water across its face. The water rises on one side, and after about a decade the pressure causes the water to break through in a single, cataclysmic event. We didn't wait a decade for the next break through, but we did witness chunks of the face plunging into the water with a thunderous roar. After spending a few hours there, we returned to Calafate, then embarked on the long haul north to El Chalten, on a principal but unpaved road. We sustained a flat along the way, but the driver was well prepared for the rugged road, with three spare tires and wire fastened in front of the windshield to deflect rocks. We checked into the hotel "Rancho Grande", and prepared to head into "Los Glaciares" National Park, which includes the famous climbing destinations of Fitz Roy and Cerro Torre. Our itinerary included a two day out-and-back run to a camp ground, then a one-day run to another part of the park. The next morning was sunny but very windy. We run up to Laguna des los Tres, which started as an easy run then became a steep, short scramble up to the laguna, where we got great photo's of Fitz Roy. We then ran upstream along Rio Electrico to a camp called Piedra del Fraile (Friar's Rock), which is principally used by climbers heading out to conquer the park's granite spires. We watched some Spaniards practicing their climbing skills on top-rope, while waiting for weather to clear to climb Fitz Roy. Devy chatted with them in Spanish, then reported that they had put most of their equipment and protection in place on the mountain, and now were waiting for a four-day window of clear weather to summit their peak. We cooked dinner, then bedded down in tents and sleeping bags which Devy had prearranged. The following morning the plan was to scramble out of the valley, across a glacier and a mountain pass, for vistas of the more distant peaks in the region. The trail rose steeply from the valley, and we ascended about 3,000 ft. in what must have been only three miles. High up in the scree, the wind whipped and clouds enveloped the mountain peaks. Devy, Gard, and I hunkered behind a big rock, waiting for the others to arrive, while deciding whether the continued ascent would earn us the great vistas. As our bones got chilled, and the clouds grew thicker, our resolve waned and we noticed that none of the remaining party members were catching up. It was clear that their resolve had waned more quickly, and we hurried back down into the valley and to the Piedra del Fraile camp, where the others were enjoying a hot drink purchased at the camp's store. We regrouped and headed down the valley, retracing the previous day's route, then performed some clever cross-country navigation to get across a river and onto the trail back to El Chalten, covering perhaps 26 miles in all. We bedded down for another night at the Rancho Grande. The next day's itinerary was a simple out-and-back to Laguna Torre, about 16 miles, to see a different area of the park. It was raining a bit, and blowing like crazy, and a few of the runners "rewrote" the itinerary to have a rest day. Byron and I decided to brave the weather. Urged on by the chill, the run became more of a "tempo" run than a sight-seeing one. The afternoon was spent lounging back at the Rancho Grande. After a fine steak dinner, we returned to Calafate that evening. The next day we rested, gathered souvenirs and postcards, then rode across Argentina to Rio Gallegos, where we caught a short flight south to Ushuaia. Ushuaia is southern. It claims to be the southernmost city in the world. Emerging from the airport after 9PM, there was still plenty of daylight. It was clear that we were at the point where the Andes meet the sea. Rugged mountains to the north bordered the town. Timberline was perhaps 2000 ft., and snow was visible even lower. To the south, peaks of the submerged Andes jutted up as islands in the bay. This was Tierra del Fuego, the southern tip of the South American mainland and the jumping off point for Antarctica. The next morning we caught a bus which Devy had summoned to take us to Tierra del Fuego National Park. We were bundled up to endure the chilly Ushuaian spring weather. The day consisted of running through forests and along the rocky shores of the bay, green and scenic, but not beckoning any sun bathers. The weather changed constantly as the clouds blew through. One minute it was sunny, the next cloudy, then drizzly. I found myself steadily donning and stripped layers. We covered about 20 miles, point-to-point, and caught a scheduled bus back to town. We had a nice pizza-and-beer dinner, and wandered around town. The crest above the door to one store read "Tierra del Humo" (Land of Smoke), referring to the name given by early explorers when seeing omnipresent smoke from the natives fires. Back in Spain it was reasoned, "where there's smoke there's fire", hence the revised name "Tierra del Fuego." Our last full day in Ushuaia, we took a boat tour around the bay, cruising for photo opportunities along rocks inhabited by sea lions and nesting cormorants. The following day we were surprised by a change in the plane schedule, giving us an extra half day to take in a mountain hike to a glaciated pass above town, before our afternoon flight to Buenos Aires. The climate was drastically different. We found it humid, with temperatures in the eighties, in this metropolis. That night we took in a tango show. The next day we wandered the city, before catching the red-eye flight back to Santiago then Los Angeles. Having been away for sixteen days, it was good to be home, a bit tired but happy to have had the exotic adventure.